Llandinam ( Welsh pronunciation) is a village and community in Montgomeryshire, Powys, central Wales, between Newtown and Llanidloes, located on the A470. As a community, Llandinam is made up of the village itself, small hamlets including Plas Dinam and Little London and several farms. Llandinam was the family home of David Davies who was responsible for much of the development of the South Wales Valleys and the export of coal in the 19th century. The house that David Davies built, Broneirion, remains an elegant country mansion owned by Girlguiding Cymru. The parents of Murray Humphreys, one of Chicago's most feared Prohibition gangsters, emigrated to the United States from the village in the late 1890s. The bridge from the main road over towards Broneirion was the first cast iron bridge constructed in the county, designed by Thomas Penson and built by Davies 1846. It spans 90 feet (27.5 m). At the east end of the bridge there is a statue of David Davies. Gordonstoun school was evacuated here for the duration of World War II. The local village school was threatened with closure in 2003 due to falling pupil numbers; thanks to a popular local campaign it was temporarily saved. Llandinam was voted the Best Kept Village in Wales in 1986. Previously served by Llandinam railway station on the Llanidloes and Newtown Railway. 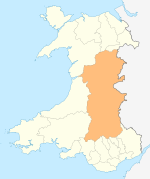 An electoral ward in the same name exists, which also covers the neighbouring community of Mochdre. The population of this ward at the 2011 census was 1,405. It elected its first Conservative County Councillor in May 2017. St Llonio's Church is located immediately north of the village centre, on a spur jutting into the Severn Valley, and within a fortified promontory fort, the defensive bank forming, until recently, the northern boundary of the church. It was originally the mother church of those at Llanidloes and Llanwnnog, serving a monastery until the late 13th century. It is claimed that the church dates back to AD 520. It was initially a clas structure,[clarification needed] with its western tower containing a pyramidal slate roof over a timber belfry, dating from the 13th century. It is recorded as Ecclesia de Landinam in the Norwich Taxation of 1254 with a value of £1 6s 8d. The majority of the church was rebuilt in the 19th century, coinciding with the restoration by George Edmund Street. The church still retains some original features, however, most notably the northern wall of the chancel. The church has a wooden reredos, two old tomb recesses in the sanctuary, a damaged perpendicular font and a number of 17th-century carved choir stalls. The square western tower probably dates from the 13th century with its timber belfry designed in Marches style. Rebuilding culminated in 1864-65 and left only the north wall of the chancel remaining from the previous design. During the restoration, new windows in square headed frames were inserted throughout the church and all the windows were replaced in neo-Gothic style. In the centre of the burial ground, to the south-west of the church, is an ancient yew tree claimed to be around 800 years old. South-west of the yew is a large oak tree. There is another large yew to the north-west of the churchyard several Irish yews on the west side. The church, which is a Grade II listed building lies in the Church in Wales parish of Bro Arwystli. It has its own Facebook page, which features photographs of some of its unique architectural features. ^ "Community population 2011". Retrieved 11 November 2015. ^ Davies, John; Jenkins, Nigel; Menna, Baines; Lynch, Peredur I., eds. (2008). The Welsh Academy Encyclopaedia of Wales. Cardiff: University of Wales Press. p. 477. ISBN 978-0-7083-1953-6. ^ "Ward population 2011". Retrieved 11 November 2015. ^ a b c d "Church of St Llonio, Llandinam, Powys". britishlistedbuildings.co.uk. Retrieved 16 September 2018. ^ "John's Homepage". www.jlb2011.co.uk. Retrieved 16 September 2018. ^ a b c "Clwyd-Powys Archaeological Trust - Projects - Longer - Historic Churches - Montgomeryshire Churches Survey - Llandinam". www.cpat.demon.co.uk. Retrieved 16 September 2018. ^ a b "ST LLONIO'S CHURCH, LLANDINAM - Coflein". www.coflein.gov.uk. Retrieved 16 September 2018. 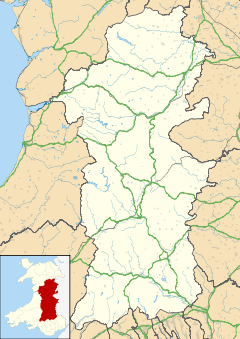 ^ "Llandinam - The Parish of Bro Arwystli". parish.churchinwales.org.uk. Retrieved 16 September 2018. ^ "St Llonio's Church, Llandinam - Llandinam - Church of God - Facebook". www.facebook.com. Retrieved 16 September 2018. This page was last edited on 14 January 2019, at 14:26 (UTC).